Over the last couple of decades, the practice of acupuncture has been getting a serious foothold all over the western world and especially here in the United States. As its acceptance has grown so has similar trends such as cupping and now, ear seeds (also referred to as auriculotherapy). Unlike standard acupuncture, ear seeds are tiny seeds that you can actually leave in your ears for long periods of time. They help treat ailments such as headaches and anxiety and are also effective for issues such as weight loss and detoxification. If you’re still confused, don’t worry. We’ll break down how they work and all the ways they might be an excellent alternative treatment for you. Ear seeds originated, like other forms of acupuncture, from traditional Chinese medicine. 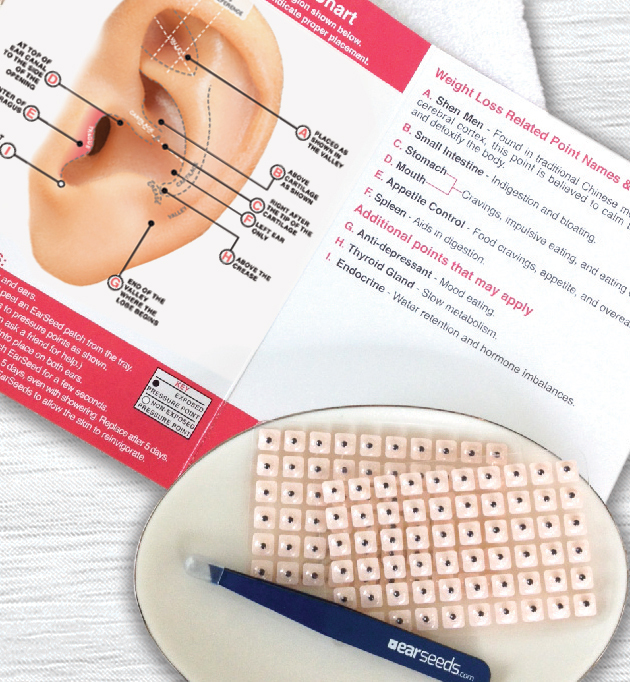 The ear is packed with points which connect to the entire human body and by properly stimulating these points it is possible to treat particular symptoms. So, in many ways, it’s simply another form of acupuncture but instead of needles you use seeds from the Varria plant which are stuck to the ear. Usually, ear seeds can be left for five days or more and don’t pose any issues during showering or sleeping. These little seeds are an excellent alternative to prescription or over the counter meds for headaches as well as other issues like back and muscle pains. However, some of the best-proven application for this form of treatment is for issues surrounding addiction, weight loss, and stress because ear seeds are “pattern-interrupters.” This means that they can be applied when a person is dealing with a pattern which triggers their personal issue, such as stress eating. A person can simply apply pressure to the seed (or apply one to the exact point as directed by the acupuncturist) and take some deep breaths until the stress is relieved. The same goes for issues such as quitting smoking, anxiety, and drug addiction. Ear seeds are a great option for these as it adds a buffer between a person and their knee-jerk reflex to indulge a negative pattern.